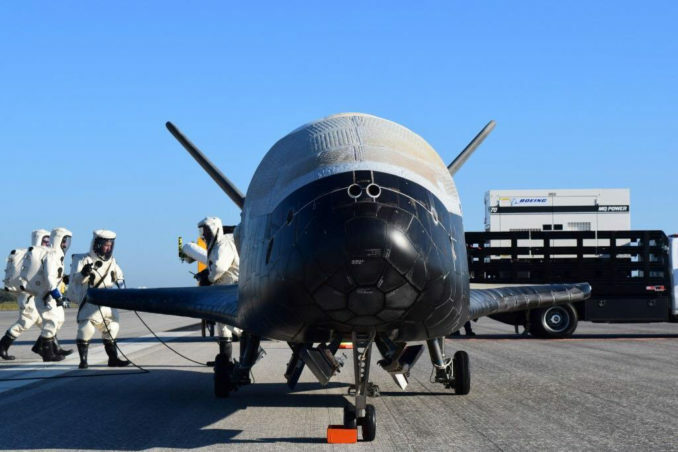 CAPE CANAVERAL — The Air Force’s robotic X-37B mini space shuttle swooped out of obscurity today after 718 days spent in orbit on a secretive military mission, touching down at the Kennedy Space Center’s orbiter runway on autopilot, the military announced on Twitter. It was the fourth flight for the unmanned test project, an enigmatic program that has used twin reusable vehicles to amass 2,086 cumulative days in space by launching like a satellite atop Atlas 5 rockets and then landing like an airplane. But today marked the first X-37B landing at the Kennedy Space Center and used the same Shuttle Landing Facility runway as NASA’s manned orbiters from 1984 to 2011, signaling a long-sought programmatic evolution to consolidate both launch and landing operations at a single homeport. The stubbed-winged orbiter will be towed later today from the Florida runway to a modified NASA shuttle hangar, left over from retirement of the civilian program, for post-flight deservicing. Early this morning, the craft received the ground-issued command to return to Earth, initiating a fully autonomous sequence of events to fire its propulsion system and brake from orbit. Plunging through the atmosphere for a super-hot reentry, the spaceplane executed a series of turns to dissipate speed as it flew towards the Cape. A concussive sonic boom announced the Orbital Test Vehicle’s arrival in the skies over Kennedy Space Center. With Runway 15 fast approaching the glider dropped its landing gear with dinner plate-sized wheels for a tire-smoking touchdown at 7:47 a.m. EDT (1147 GMT) while flying on a sophisticated autopilot fed with GPS navigation. Total flight duration was 717 days, 20 hours and 42 minutes from liftoff to landing. The #AirForce #X37B #OTV4 has returned from orbit and has landed safely @NASAKennedy. Stay tuned for more info. Although it had maneuvered to various altitudes throughout its two years in space, hobbyist satellite observers had tracked the vehicle in a 200 by 220 mile orbit tilted 38 degrees to the equator, before it lowered to a 191 x 199 mile orbit in February and then raising to 220 x 225 miles. Today’s landing capped the fourth spaceflight for X-37B, also known as the Orbital Test Vehicle program. The Air Force has never identified which of its two spaceplanes flew this specific mission. “The X-37B testbed platform is unique because we can tailor to specific user needs and return experiments back to post-flight inspection,” Ken Torok, Boeing’s director of experimental systems, aid at launch. Officials have said early flights would test out the system and twin vehicles themselves in a proof of concept to operate a fleet of unmanned spaceplanes economically and technologically for the U.S. military. 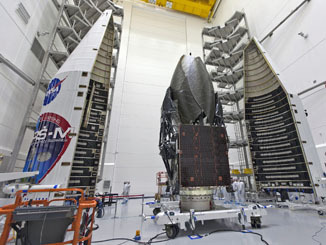 But this X-37B carried at least two payloads on its latest voyage. The military revealed before the ship took off that it was carrying an experimental electric propulsion thruster to be tested in orbit and a pallet to expose sample materials to the space environment. 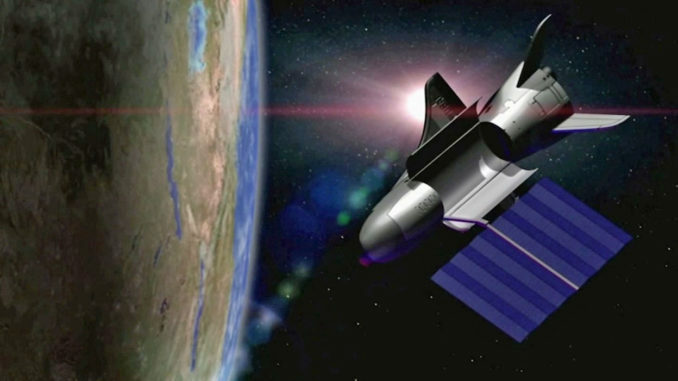 Made by Aerojet Rocketdyne, the enhanced five-kW Hall Thruster, called the XR-5A, was tested aboard the spaceplane for the Air Force Research Laboratory and Space and Missile Systems Center. 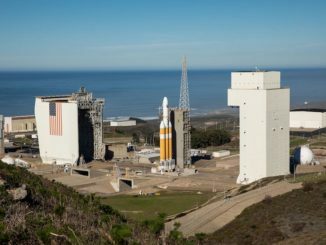 Operation of the modified thruster — said to have improved performance and operating range — was checked by measuring the thrust imparted on the vehicle before inclusion aboard the military’s future Advanced Extremely High Frequency ultra-secure communications satellites. There also was a NASA advanced materials investigation aboard the X-37B. Known as the Materials Exposure and Technology Innovation in Space, or METIS, the experiment exposed nearly 100 different quarter-sized samples of polymers, composites and coatings to the harshness of space. What else this craft carried, if anything, was not divulged by Pentagon officials. “We’re very pleased with the experiments lined-up for our fourth OTV Mission, OTV 4,” said Randy Walden, the director of the Air Force Rapid Capabilities Office, when this craft launched. Mounted atop a United Launch Alliance Atlas 5 booster, the shuttle was tucked inside the voluminous nose cone and simply along for the ride as it left Cape Canaveral’s Complex 41 on May 20, 2015. It was delivered into low-Earth orbit, opened its clamshell payload bay doors and extended a power-generating solar array. The mission operated in total secrecy, except for satellite-tracking hobbyists who monitored the vehicle and its changing orbit when it made bright, visible passes in the early morning or early evening sky at observers’ locations around the world. Although the launch was publicized in advance, the landing came with no official notification. The Air Force broke with its own precedent set on the three previous landings and offered no advance warning this time. One-quarter the size of NASA’s now-retired space shuttle, the robotic X-37B conducts its mission and then autonomously returns to Earth for a pinpoint touchdown on a conventional runway to be refurbished and reused. It harkens back to the manned space shuttle era, taking payloads up and down, and flying the same orbital trucks over and over again. 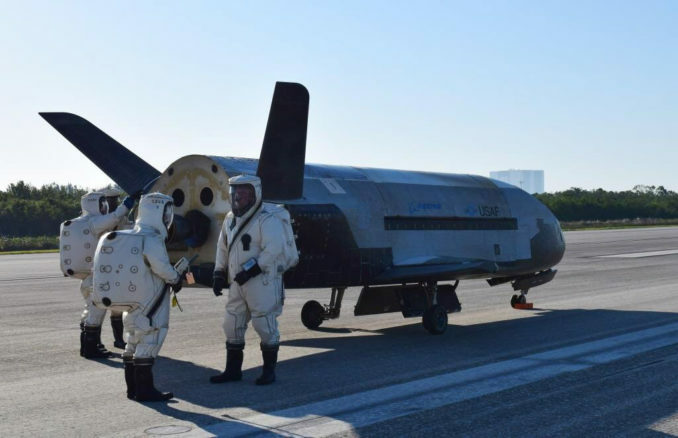 While the first three X-37B missions touched down at Vandenberg Air Force Base in California, the Air Force had acknowledged it was looking to land this latest flight at the Kennedy Space Center in Florida. “We’re seeking to leverage previous space shuttle investments and are investigating the possibility of using the former shuttle infrastructure for X-37B OTV landing operations,” an Air Force spokesperson said before launch. That infrastructure includes the former space shuttle hangars, known as Orbiter Processing Facility bays, where the ships underwent post-flight operations and were readied for the next mission. In early January 2014, Boeing announced it would proceed with creation of a homeport for X-37B in Florida and create technology, engineering and support jobs. “Investments will be made to convert the former space shuttle facility, OPF-1, to a facility that would enable the U.S. Air Force to efficiently land, recover, refurbish and re-launch the X-37B Orbital Test Vehicle,” Boeing said a press release. “This is a great opportunity to utilize Brevard County’s talented workforce in support of our nation’s next-generation space vehicle research platform,” Mary Bolin Lewis, chairman, Brevard County Board of County Commissioners, said at the time. KSC has a three-mile-long concrete landing strip where space shuttles landed for three decades. It is the same length as the Vandenberg runway that X-37B has used. Built in 1975, KSC’s Shuttle Landing Facility is a concrete strip 300 feet wide and 15,000 feet long with 1,000-foot overruns at each end. The runway is located about three miles northwest of the 525-foot tall Vehicle Assembly Building. NASA’s space shuttles landed in Florida 78 times. X-37B features a pickup truck-size cargo bay, seven feet long and four feet wide, that could be filled with equipment being exposed to the harsh environment of space for proof testing or could contain experimental instruments intended for use by future military and reconnaissance satellites. The craft’s unique capability to drop from orbit and land on a runway allows technicians to get their hands on the hardware after it spent a long period of time in space. Wild speculation about the spaceplanes and their missions has ranged from secret flyby surveillance of China’s orbital station to the weaponization of space. But the Air Force stresses that the X-37B is a test bed to carry experiments into space. “It’s really for cool things. For instance, it goes up to space but, unlike other satellites, it actually comes back. Anything that we put in the payload bay that we take up to space, we can now bring back, and we can learn from that,” Gen. John Hyten, formerly the head of Space Command, told CBS News on its “60 Minutes” program a month before this X-37B was launched. On-orbit maneuverability is accomplished through small thrusters on the ship’s nose and tail, plus a large engine in the back. There are no hydraulics aboard the X-37B. Flight controls and brakes use electromechanical actuation. The cost of the OTV program is classified. A fifth X-37B flight is planned to launch later in 2017, the Air Force says.